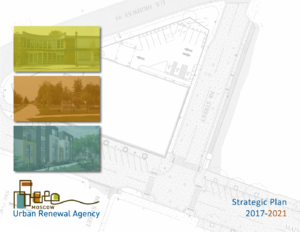 In 2016 the Moscow Urban Renewal Agency undertook its first strategic planning process to help establish a long-range direction for the Board and help communicate the Agency's mission, vision and public investments to community members and others. During the strategic planning process, many partner agencies identified a desire to increase collaboration and coordination with the Agency. Through this planning process, the Agency Board identified the need to improve the manner in which the Agency communicates its mission and purpose with stakeholders, partner agencies and the public to share the impacts of the public investments made by the Agency. The strategic plan is accompanied by a capital improvement plan which lists public investments identified by our partner agencies and sets a framework for the Agency's financial assistance in this important community projects over the upcoming five years. The strategic and capital improvement plans are intended to be living documents that will be reviewed and updated upon an annual basis.